With a little over 5,000 days before the Sustainable Development Goals expire, two things appear inevitable for their funding: the need for private capital and a way of ensuring it reaches SDG projects across the globe. While there is some progress towards this, have we done enough to ensure that it flows across the globe with a reasonable consistent flow? Probably not. According to the United Nations Conference on Trade and Development (UNCTAD), over $1.7 trillion moved across the globe as foreign direct investment (FDI) in 2015. Developed economies received the most inflows ($962 billion) followed by developing ($764 billion) and transition economies ($35 billion) respectively. While it is encouraging to see FDI inflows to developing countries, the developed markets continue to dominate as the preferred investment destinations. Countries fiercely compete to attract FDI. Seeking to keep investors happy, they continuously monitor what incentives the competing markets are offering, and adjust their policies and legal framework regularly. However, the overall market potential and the quality of governance are among the key factors that investors consider. 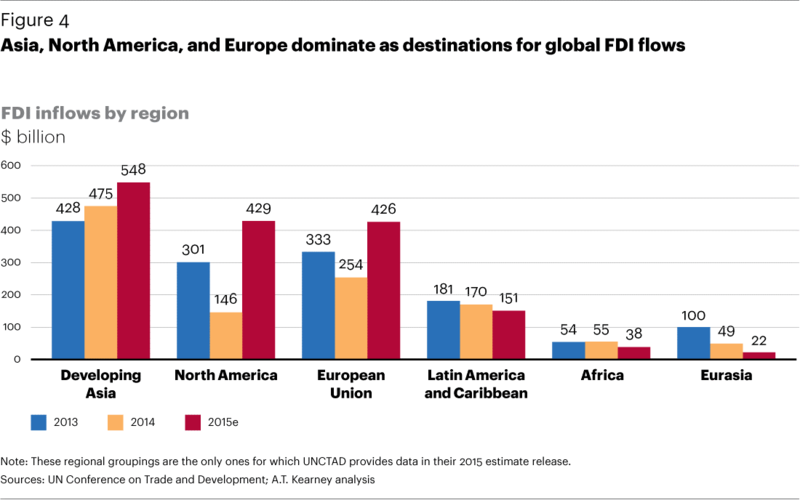 To stay ahead of the game, countries often develop niche FDI sectors based on their unique strengths (such as cheaper raw materials and labour costs). As the countries constantly try to strengthen their brand amidst this aggressive economic competition, investors continue to analyze the global investment landscape both from efficiency and strategic perspectives. How can the SDGs co-exist in this profit-driven, aggressively-competitive and constantly-evolving environment? How can we deliver a win-win-win for investors, countries and the SDGs? The business case of funding the SDGs is very strong. For instance, a recent report by the Business and Sustainable Development Commission suggests that a $4 trillion annual investments opportunity exists in four areas (namely, food and agriculture, cities, and energy and materials). The report predicts that the current investment (of $4 trillion) could be worth more than $12 trillion in 2030. Additional savings and revenues of trillions of dollars annual can result from the opportunities unlocked by the Global Goals, the report adds. Viewed from the business opportunity perspective, a report by the Brookings Institution estimates that the Global Goals require an additional amount of over $5-7 trillion a year by 2030. The public exchequers are exhausted; so is international and other development assistance. The shortfall must therefore be met from other resources such as private capital, which continues to flourish in many ways. The Global Wealth Report 2016 estimates over $250 trillion of household wealth. Just to put this number in perspective, the global GDP of 2015 was roughly $74 trillion. While this household wealth may already be yielding risk-adjusted returns, it is also reasonable to expect that this wealth may find sustainable development as a perfect investment opportunity – of course, only if there are enough incentives. The scalable ways to direct the private capital to the SDGs are being developed. Multiple challenges exist that are hampering such development. UBS highlights some of them as a lack of transparency, absence of reliable data, lack of standardization, and insufficient incentives. Multilateral Development Banks (MDBs) have been working very hard to bridge the gaps between private capital and the SDGs. They are developing and experimenting newer methods and strategies. For instance, tools like blended finance are already being used and expanded. Impact investing and finance is gaining exponential popularity among sophisticated investors. In other words, development finance is progressing well to connect finance and development. However, countries should present the SDGs as investment opportunity. Various global initiatives provide innovative support to ventures advancing the SDGs. The support includes credit enhancement, blended finance, equity and debt financing, technical expertise, and insurance (“Global Incentives”). However, countries must do their respective homework to make the Global Incentives more effective. Countries can begin by undertaking a comprehensive SDG assessment. As part of this exercise, they will be able to identify the projects to meet the SDGs in time. Once the projects are identified, a budgeting and funding analysis will help them develop annual plans leading up to 2030. Based on this budgeting and planning exercise, countries can make their respective investment policy to make the SDGs into a new investment-ready sector (“SDG Investment Policy”). The SDGs sector must match the tax and other incentives offered to investors in, say, manufacturing and services sectors. Distinguishing the SDGs, countries can also offer specific incentives (such as Social Credits or Sustainable Development Credits) to top-up the attraction for the new sector. This policy entrepreneurship by countries will allow clear view of the business opportunity. While countries may continue to pursue their individual competitive edge for seeking investments, some features of SDG Investment Policy (such as Global Incentives) should remain consistent globally. 1. Global Incentives: Developing a model incentive package backed by MDBs. 2. The demand side: Helping countries with their SDG Investment Policies. 3. The supply side: Convening an investors’ forum (possibly by expanding and consolidating some of the similar existing forums). A globally consistent incentive package should include the type of support that will be available for investors and how investors may qualify. Country-specific packages may be added to the global package. Countries could be helped through technical assistance for developing policies, project pipeline and integrating incentive package. The policy may include some qualifying conditions such as a pledged investment programme for the next 5, 10 and 15 years. The local and global incentive packages should then be linked to progress made pursuant to the pledge. Convening an investors’ forum would provide the opportunity to showcase project pipelines, policies and available incentives. This may also convert to a digital marketplace (similar to what is envisioned as Align17). As projects are picked up by interested investors, countries can monitor with greater precision which countries and sectors are being left behind, and based on that, newer policies and incentives can be developed. Such an approach will also allow for progress across all countries and different SDG-sectors to be kept consistent.